With a CSOP, a company can grant tax-advantaged options over shares with a value per individual of up to £30,000 as at the date of grant. The company can choose to grant options only to selected employees or to all employees. Unlike with EMI, any size of company can use CSOPs and there aren’t the same rules about having to carry on a qualifying trade. There are conditions to be met, but it is the company’s job to check the requirements are satisfied. The acquisition of shares on the exercise of a CSOP option three years or more after the date of grant, will be free of income tax and national insurance contributions. Options must be granted with an exercise price which is equal to or exceeds the market value of a share at the grant date. Discounted options cannot be granted under a CSOP. The options therefore only provide a benefit to the extent that the value of the shares increases between the date of grant and exercise. When can a CSOP option be exercised? The rules of the CSOP will say when you can exercise your option. The company decides what the rules say. Tax rules tell us when tax-advantaged treatment applies – but the rules don’t have to allow exercise in every situation when tax reliefs would be available. Normally, the tax rules say that favourable tax treatment only applies to a CSOP option if it is exercised more than 3 years from the date of grant. “good leavers” – disability, retirement, redundancy, the business you work for being transferred outside the group (sometimes called a TUPE transfer) or the company you work for being transferred out of the group (if exercised within 6 months). death (if exercised by your personal representatives within 12 months). Exercise of a CSOP option because of certain company events, for instance a cash takeover, may also benefit from tax-advantaged treatment. The company should explain what the time limits are and what the tax situation is expected to be. What are the shares worth? If the share price is above the exercise price you have to pay, it will usually be worth exercising your option (although there’s no guarantee the share price won’t fall after you have exercised). Can you sell shares if you need to? Unless you have some spare cash, you may need to sell at least some of your shares to pay the exercise price and sort out your employment taxes. Sometimes, the company will offer a cashless exercise. This means that rather than you finding the cash to pay the exercise price out of your own pocket, you agree they can sell enough of your option shares to pay the option exercise price (and any employment taxes that become due if you are not exercising at a time when tax advantaged treatment applies) and deliver the rest of the shares to you. This is sometimes called ‘Sell to Cover’. Sometimes the company may offer the choice to sell more of your option shares if you want to. The tax information on this page concentrates on CSOPs. For other tax information, click through to our Tax page. There is no tax when your CSOP option is granted. If you exercise your CSOP option in tax-advantaged circumstances, there is no tax at that point. Any growth in value of the shares between grant and exercise is free of income tax and national insurance contributions. However, you may need to sell at least some of your shares in order to fund the option exercise price. When you sell your option shares, you have to think about capital gains tax. The starting point for the calculation of gains and losses on the disposal of the shares is the option exercise price. This means that any growth in value from the time of the option grant up until the point where you dispose of your shares may be subject to capital gains tax. Whether any tax is due will depend on your individual circumstances, including whether your capital gains tax annual exemption is available. If you also hold other shares in the company, you may also need to consider the share identification rules. If you exercise your CSOP option within three years of the date of grant and it’s not for one of the CSOP ‘good leaver’ reasons, nor is it due to one of the ‘company events’ where tax advantaged treatment is available, the gain will be subject to employment taxes. The gain is the amount by which the market value of the shares at the date they are acquired exceeds the exercise price. What if you also have a non tax-advantaged share option or award? It sometimes happens that on the same day you acquire shares under a tax – advantaged CSOP and also shares under a plan that is not tax- advantaged and you decide to sell only some of them, or need to sell some of them to cover taxes. For instance you may get shares under the company’s LTIP, or perhaps an option plan that allows option grants in excess of the £30,000 individual limit that applies to CSOPs, and employment taxes will apply to those other awards. In this situation you might want to elect to override the normal share identification rules and instead be treated as selling the non-tax advantaged ones first using the special rules for same day share acquisitions. Depending on your circumstances, doing this could avoid tax becoming due when you didn’t expect it. The company granted CSOP options when the share price was £1. The exercise price is £1 per share and you were granted an option over 20,000 shares. After 3 years, in tax year 2018/19, the share price has risen to £2 and you decide to exercise your option. The exercise price that has to be paid is £20,000 and the shares you get are worth £40,000. Exercising the option doesn’t trigger any tax. The price you paid for the shares, £1 per share, is your starting point for working out the base cost for capital gains tax purposes. There may be capital gains tax if you dispose of the shares. You might need to sell some of the shares in order to pay the exercise price. The company might help you to sell shares to fund the exercise price by putting in place a cashless exercise facility. If the company offers a cashless exercise facility and you decide to use it, the company will arrange to sell enough of your option shares to pay the exercise price and the costs of sale. In this example 10,000 of your shares are sold at £2 per share, enough to fund the total exercise price of £20,000 (we are ignoring costs of sale to keep the numbers easy). You make a gain of £1 per share or £10,000 in total (the sale price of £2 per share less the exercise price of £1 per share, multiplied by the number of shares sold). If you haven’t made any other capital gains this year, the gain of £10,000 will be covered by your capital gains tax annual exemption. You can keep the remaining 10,000 shares or sell some or all of them. If you sell them, it’s worth remembering that almost all of your capital gains tax annual exemption has been used up through the cashless exercise, so the sale may trigger a chargeable gain. If there is a chargeable gain, it is your responsibility to report it to HMRC and pay your capital gains tax bill (for chargeable gains in tax year 2018/19 the deadline is 31 January 2020 at the latest to avoid penalties and interest). If you keep the remaining shares until after 5 April 2019 you will have next year’s capital gains tax exemption available, which may mean there is no tax to pay. By then your £10,000 shares may be worth more than their £20,000 value at the time you exercised your CSOP option, or, if the share price has fallen, they may be worth less. There is more information on the Tax page. Tax-advantaged treatment normally applies after 3 years from grant. Sometimes the company will offer a cashless exercise so you can fund the exercise price (and any employment taxes) by selling shares. 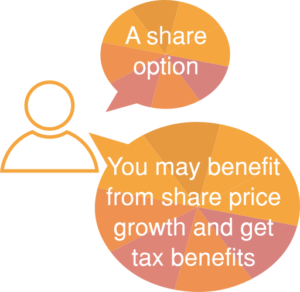 Most people benefit from their capital gains tax annual exemption if they make a gain when they sell their CSOP shares. If you exercise your CSOP option at a time when tax-advantaged treatment does not apply, the gain on exercise is subject to employment taxes.